Too hot to cook? 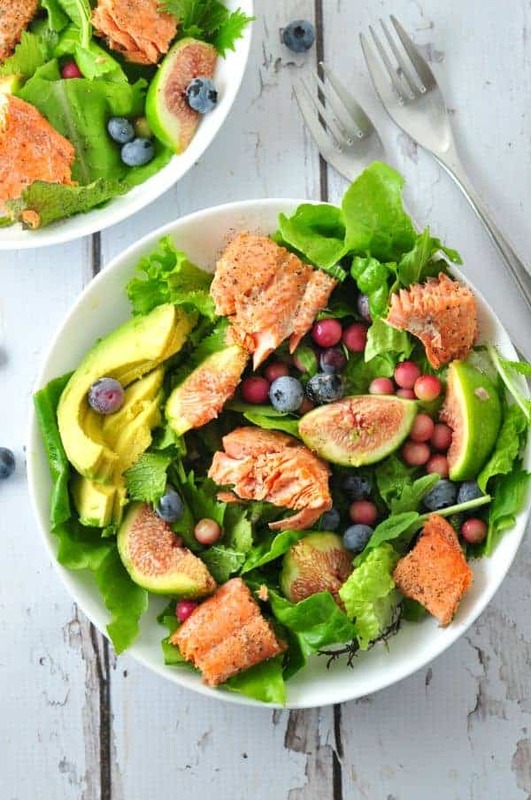 This grilled salmon salad with blueberries and figs is a hot weather meal in a bowl! Have you ever wondered how to grill salmon without it sticking to the grates? We love wild sockeye salmon and find it quick and easy to grill a fillet on the barbecue. 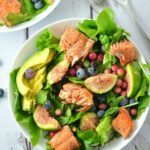 This grilled salmon salad makes use of the fruits and vegetables that are available in the spring and summer months. I added blueberries (both blue and the less common pink ones), fresh lettuce, arugula and mixed greens, avocado, and fresh figs to this antioxidant-rich summer salad. It’s dressed with a simple, but flavourful honey-balsamic vinaigrette. 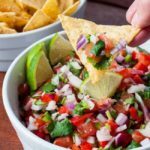 Quick, easy, nutritious and a perfect meal for a hot summer day! It’s hot here and it looks like this warm, dry weather is here to stay for a while. While we love the sunshine, it is taking its toll on our local water supplies and the threat of forest fires is very real. Severe sprinkling restrictions have been in place all summer, lawns are dry and crisp, and cars are dusty. 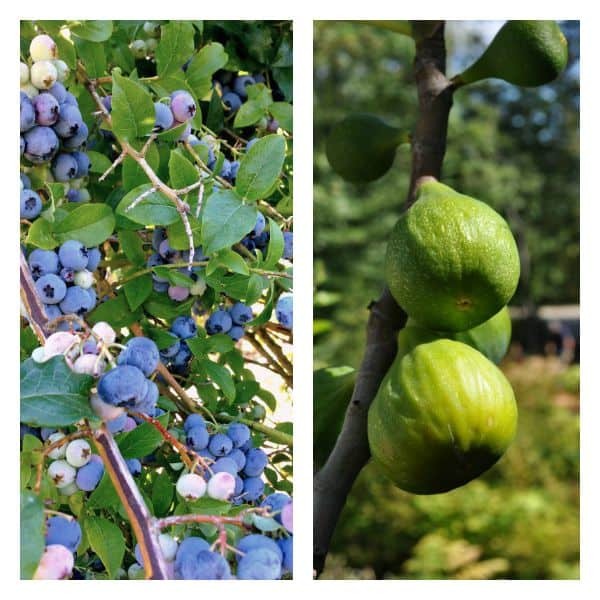 So, what to eat to beat the heat? 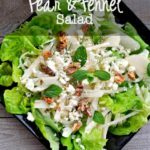 Simple salads like this one are on the menu in our house! 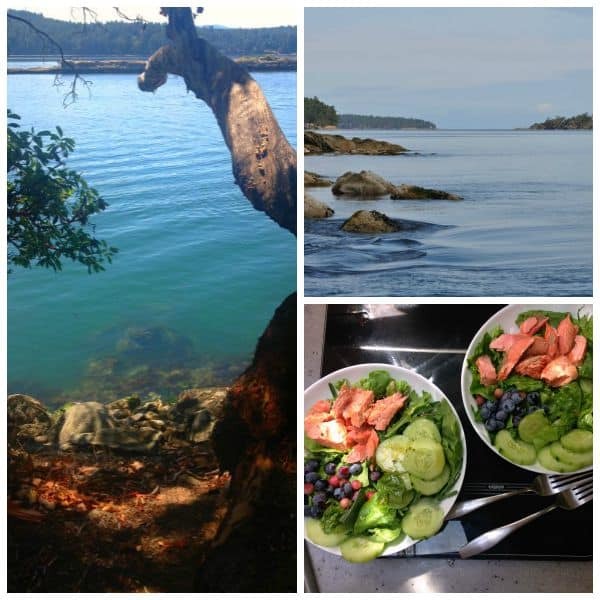 This salmon salad was an easy supper on our last boat camping trip. Spending as little time as possible preparing meals is my goal when there is so much to explore and enjoy out on the ocean. Fish is delicate and it will fall apart on the grill if not handled correctly. Here are my tips for grilling salmon on a gas barbecue. Heat the grill to medium heat. Dip a wad of paper towel in a small amount of cooking oil, then using tongs, wipe the grate thoroughly several times, (at least 5 to 7). Coating the grate in oil is like seasoning a cast iron fry pan. This layer of oil will coat the grate and help to prevent the proteins in the salmon from sticking. Brush both sides of the salmon fillets with oil. Season with salt and pepper. Place the fillets skin side down diagonally to the grates. Lower the heat, close the lid and let it cook undisturbed for 2 – 4 minutes or until the skin is nicely browned and crisp. Using a fish turner, gently lift one end of the fillet. If it doesn’t release easily, let it cook a little longer, checking frequently until it releases on its own. Once it releases, very carefully flip the salmon. Close the lid and cook on the other side until opaque. You’ll know it’s done when it registers 125°F on a meat thermometer or when it flakes easily with a fork. Remove it from the grill and let it rest for 5 minutes before serving. Grill the salmon, arrange the greens, figs, berries and avocado, top with chunks of salmon and drizzle it all with a honey-balsamic vinaigrette. And then get outside to enjoy some warm sunny weather while it lasts! 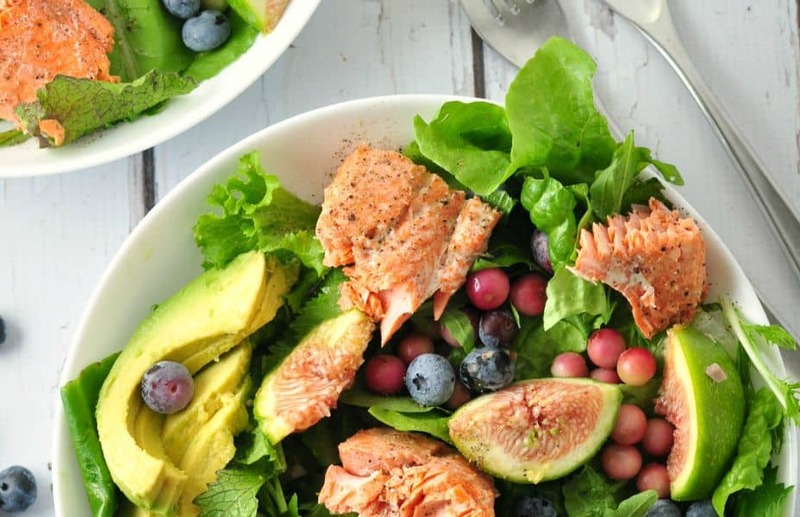 This Grilled Salmon Salad features fresh figs, blueberries and mixed greens. 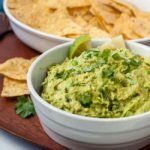 Add a sliced avocado for healthy fat and dress it with a light honey-balsamic vinaigrette. Toss freshly washed greens with honey-balsamic vinaigrette and arrange on serving plates. Top with fresh quartered figs, blueberries and sliced avocado. Brush salmon fillet with 2 teaspoons oil, sprinkle with salt and pepper. Place skin side down diagonally on the grate of your gas grill. Lower the lid and cook for 2 - 4 minutes. Gently lift the fillet with a fish turner. If it releases, carefully flip it over to the other side. If not, let it cook a little longer, then try again. Lower the lid and grill for 5- 7 minutes on the other side or until fish is no longer opaque, it flakes easily with a fork, or it has reached an internal temperature of 125°F. Brush with 1 tablespoon honey or maple syrup and grill 1 - 2 minutes more. Remove from heat and let rest for 5 minutes. Slice salmon into bite-sized pieces and arrange on salad. Drizzle with honey-balsamic vinaigrette. 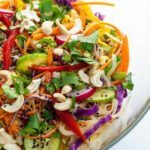 Nutrition information is based on using half the amount of vinaigrette. Can dried figs be used for this one rather than fresh figs when I can’t buy fresh figs? Dried figs are much harder and more chewy than fresh figs, which are very soft. You could try reconstituting dried figs by soaking them in warm water, fruit juice, or even liquor to soften them. Figs add a wonderful flavour and lots of interest to a dish! Let me know if you try this. I’d love to hear how it turns out! This salad was so so so good . I could scream summer is finally here. I love it thank you for this tasty treat .